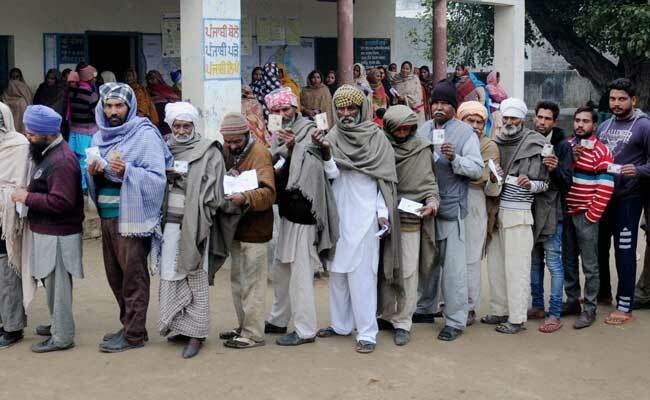 Punjab went to polls in a single phase on February 4 and recorded 78.60% polling. Chandigarh: The counting process began on Saturday for the 117 Assembly seats in Punjab which witnessed a triangular contest with the ruling Shiromani Akali Dal-Bharatiya Janata Party combine, the Congress and the Aam Aadmi Party (AAP) putting up a spirited fight. 54 counting centres have been established at 27 locations for the 117 Assembly constituencies in the state, an official spokesman said here. He said that more than 14,000 officials have been deputed in the counting centres across the state. Punjab could be in for a neck-and-neck fight between the Congress and the AAP while the ruling Shiromani Akali Dal-Bharatiya Janata Party combine may face a drubbing, according to pollsters. However, the Shiromani Akali Dal-Bharatiya Janata Party or SAD-BJP alliance is confident of defying the pollsters "like in 2012", when it proved the surveys wrong. Punjab Chief Minister Parkash Singh Badal claimed the combine would win 72 seats. As for Congress, Amarinder Singh claimed it would win 65 seats. The AAP exuded confidence of bagging close to 100. The state went to polls in a single phase on February 4 and recorded 78.60 per cent polling against 78.57 per cent in 2012. 1,145 candidates are in the fray, 81 of whom are women and one transgender. The Shiromani Akali Dal contested 94 seats and its ally the BJP is 23. The Congress has contested all the seats. The AAP and its ally Lok Insaf Party, led by the Bains brothers of Ludhiana, are fighting 112 and 5 seats, respectively. The SAD-BJP alliance had won 68 of the 117 seats it contested in 2012 to retain power for the second successive term. SAD had won 56 of the 94 seats contested and its ally BJP had won 12 of the 23 seats it contested. The Congress, under the leadership of Amarinder Singh, managed to win 46 of 117 seats it contested in its bid to wrest power from the SAD-BJP alliance. Three seats had gone to independents. As far the vote share was concerned the Shiromani Akali Dal got 34.75 per cent while the Bharatiya Janata Party got 7.13 per cent and Congress had got 40.11 per cent votes. It was a record for the state when the Shiromani Akali Dal (with Bharatiya Janata Party) came back to power in 2012 as no party had ever been given two consecutive terms. Since the reorganisation of Punjab in 1966, the Congress and the Shiromani Akali Dal have been ruling the state alternately. The SAD-BJP alliance formed the government for the first time in 2007 and retained majority in 2012. Key constituencies whose results would be keenly watched include the Lambi seat, where the chief minister is locked in a triangular contest with Amarinder Singh and journalist-turned-politician Jarnail Singh (AAP). Patiala is another key seat where Amarinder Singh is up against Shiromani Akali Dal candidate and retired army Chief General J J Singh. Jalalabad, considered a pocket borough of the ruling Badal family, has two sitting MPs - Ravneet Singh Bittu (Congress) and comedian-turned-politician Bhagwant Mann (AAP) - up against Shiromani Akali Dal president and Deputy Chief Minister Sukhbir Singh Badal. Veteran Congress leader and former chief minister Rajinder Kaur Bhattal is fighting it out against Finance Minister Parminder Singh Dhindsa (SAD) from her traditional bastion of Lehragagga. AAP's Himmat Singh Shergill is fighting against Revenue Minister Bikram Singh Majithia from Majitha while Gurpreet Singh Ghuggi (AAP) is giving a challenge to Congress stalwart Ashwini Sekhri from Batala. Navjot Singh Sidhu, who after several flip-flops had joined the Congress party, contested the Amritsar East seat against Rajesh Kumar Honey of BJP. The chief minister's estranged nephew Manpreet Singh Badal is trying his fortunes from Bathinda Urban seat on a Congress ticket while Indian Youth Congress chief Raja Amarinder Singh Warring is contesting from the Gidderbaha seat. The results are crucial for Congress, which is seeking to wrest power after failing in the previous two Assembly elections fought under the leadership of Amarinder Singh. Meanwhile, after witnessing a high-profile battle between political stalwarts - BJP's Arun Jaitley and Congress' Amarinder Singh in 2014 - the Amritsar Lok Sabha by poll was overshadowed by the Assembly polls this year. The Bharatiya Janata Party has fielded 66-year-old leader Rajinder Mohan Singh Chhina, who is up against Congress' Gurjit Singh Aujla (44) and the Aam Aadmi Party's Upkar Singh Sandhu (63). The by-poll to Amritsar seat was necessitated after Amarinder Singh resigned in protest against the apex court's verdict on the Satluj-Yamuna Link (SYL) canal issue.